I’ve always affectionately classed the drums bundled with Rock Band and Guitar Hero as “Fisher Price.” No matter how hard you try there’s no way you can truly pull off the air of a true musican when doubled up over a half-sized-kit which is made mostly from plastic. They have sparked something within me, though, and since their release some six months ago I have been avidly beating away on them in the bid to become the next Phil Collins. On Friday, that dream came a step closer as the lovely people at Thomann.de kindly delivered to work a complete e-drum kit. Five large boxes containing dozens of smaller boxes have never made a man so happy. It may be electronic and operate through my headphones to spare our neighbours, but it’s no lightweight. Three hours were spent assembling it on Saturday morning and a further two just to try and get it to fit discretely into our living room. We failed at the “discrete” portion of the mission but the bunnies are enjoying their new climbing frame. In just these few short days it’s fair to say that I have fallen in love with my new shiny toy. With it so accessible it’s nice just to nip and have a bang and crash when you have a spare few minutes, as long as Ali isn’t watching Come Dine With Me at the same time. Where it truly excels, though, is its ability to be wired into Rock Band. Take the MIDI out from your sound module, plug it into the relevant port on your Guitar Hero drum kit, tweak the note outputs and within five minutes you have a novelty controller that puts Steel Battalion to shame. Going from a very compact setup to the range offered on by the e-drums is quite a shock. I’m just so used to reaching just a couple of inches that at first it was horrible. Anyone who plays games (or instruments) will know that after a while your muscle memory takes over. You don’t need to look where the X button is or where a certain string is on your guitar, you just know it. I’m slowly relearning the instinctive movements for Rock Band and with each progressing song the experience just gets better and better. 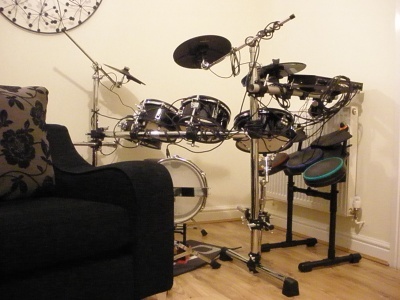 Whatever you may think about investing in such a ridiculous “toy” to go with gaming, I do think that the combination of Rock Band 2 and a full e-drum kit will help anyone with their drumming. On a basic level the whole point of those games are to play along in time, something quite critical for anyone armed with an instrument, but also because it has rhythm and fill trainers. Lurking in its depths are dozens and dozens of riffs and drum rolls for you to practise, giving you feedback on just where you’re missing the beat. It’s never going to replace music lessons but as a compliment to them it’s very beneficial. Cards on the table, it still doesn’t beat a full acoustic kit. My first port of call whenever I get into work early is the music room but for a home environment I don’t think I could have done much better. The fact it can be linked with one of my favourite games of all time just makes it even shinier. On a day like today, what on earth could be more British than Henry Hatsworth? Putting aside that it’s developed by a Florida based studio, Mr Hatsworth is the epitome of Victorian adventurers. A gentleman, if you will. With a bowler hat firmly on his head a fine moustache flowing from the upper lip, he’s ready to set off into the deepest darkest jungles to recover lost treasures from the savages and give Johnny Foreigner a damn good hiding, what, what! Just as with the last DS eccentric, Professor Layton, the character style is the first thing to set this cartridge apart from the competition. Opening cutscenes will present Hatsworth, his younger friend Cole and their nemesis Weasleby as clichés of a by gone Britain. Cole, in particular, is only a hair’s breadth from uttering the word “Guv’nor” whilst offering to shine your shoes. Playing up to this, their speech, whilst presented in the form of text boxes, is accompanied by samples that match their character with Hatsworth continually huffing and making pompous noises whereas Cole’s sounds seem to be snippets of cockney charm. The game itself, however, is a platformer. You’ll take control of Hatworth and run and jump him through jungles in search of a mysterious golden suit that is rumoured to have the power to control the world. The locals aren’t too keen on giving up their shiny attire and so their resistence must be put down with swings from your machete and shots from your hunting rifle. The early levels are very straight forward and the only time that you should see your life counter go down is either through misadventure or experimentation from seeing if that pit in front of you is actually as bottomless as it seems. I’m told that later levels do gain in complexity with the addition of a walljump, allowing access to higher areas, but so far it’s quite a standard affair. Enemies are easy enough to dispatch given enough blows from either weapon, although the odd boss fight crops up, too, to test your resolve. Where Hatsworth differs from traditional platformers is the delightful inclusion of a Tetris Attack style “parallel world”. Some how your hunt for the suit has opened up a rift between your world and the Puzzle Realm. Any enemies killed in your world are transported to this alternate plane and transformed into blocks. If they are not also disposed of in the Puzzle Realm then they will only return to try and thwart you again. An interesting narrative but an even more interesting gameplay angle as also hidden within the puzzler are powerups and health boosts for you, too. A tap of a button will see you switch screens and then its a classic “match 3” puzzle setup. Link three of more coloured blocks together and they will be removed along with any monsters they contained and granting you any powerups that they held. Obviously the more that you can remove in a single go the better and so you can always find your eye drifting down from the platforming screen to the grid of squares seeing if there’s an opportunity to setup a devastating combo. I think it’s fair to say that neither component is exceptional; I’ve played far better platformers and there are many addictive puzzlers out for the DS but both are good and what’s more important is that work exceedingly well together. Much like the Grand Theft Auto, it is more than the sum of its parts. 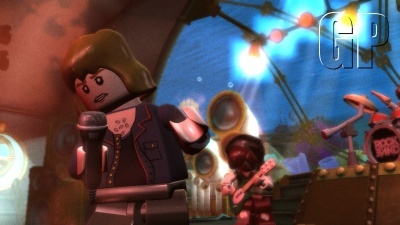 After months of rumour and speculation Lego Rock Band has been confirmed. If there was one thing I thought those angular toys wouldn’t be able to turn their hand it would be the world of rawk but here they are strumming away on their pieced together instruments. My first reaction was that this was a shocking cash in, a step down the Guitar Hero route that signalled the end of the franchise’s moral high ground. All they’ve done up until this point has seemingly put the fans first but was the temptation of the Lego cheque book too great? Maybe not, as on closer inspection it appears they are just reaching for a younger market. “Lego Rock Band combines the multiplayer music experience of Rock Band with the fun, customization and humour of the Lego videogame franchise packed with brilliant chart-topping songs and classic favourites suitable for younger audiences” claims the press release. If this is true then it could be a master stroke by Harmonix. The Rock Band and Guitar Hero brands are both well known in the medium but from personal experience they can also be quite daunting. Whether it be the image they exude, the pricing or the perceived target age range, some are put off from grabbing a plastic guitar and strumming along. Over the last few years, though, Lego videogames have built up a reputation of being accessible and welcoming which could be exactly what is needed to bridge the gap. I’m not saying that everyone who bought Lego Indy is going to drop over a hundred pounds to join in but I can see more than a few of those currently on the fence finally deciding to do so. My biggest disappointment, however, is the track listing. When the title initially surfaced I had visions of a playlist featuring Pink Floyd’s Another Brick in the Wall, The Judd’s Love Can Build a Bridge and anything from New Kids on the Block. What a missed opportunity. Feel free to leave your own Lego based song suggestions. Trophies may be Sony’s answer to Microsoft’s Achievements but, to be frank, they just don’t cut it. Achievements produce an unmistakably classic “blip” noise and pop up proudly for all to see. There in the middle of the screen so everyone around you can worship you for the gaming god you are. Trophies, however, seem to quietly sneak onto the top right of your screen trying not to be noticed and ghost off in much the same manner. They may achieve the same end result in rewarding the player for an arbitrary accomplishment but they just don’t feel like they’re rewarding me at all. I don’t want subtle pats on the back, I want fireworks and street parades, damn it! For the sake of one simple noise I can safely say that I will not be going Trophy hunting. There are a clear subset of games which I can easily lose my wife to. 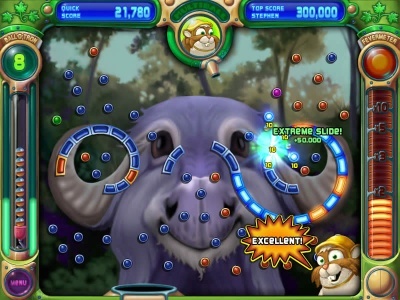 Zuma is one, Zoo Keeper another and in recent weeks I can now add Peggle to that list. 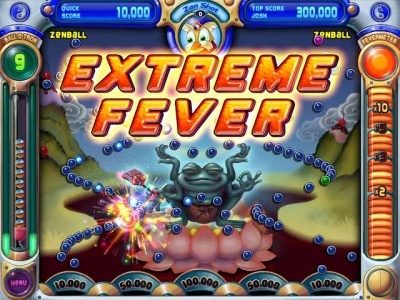 Peggle is a cross between the pachinko machines of Japan and bagatelle. Faced with a board full of pegs and armed with a limited number of balls, the aim is to clear a batch of designated pegs by bouncing, cannoning and ricocheting your balls off them. When the ball falls off the screen the pegs that you’ve hit will disappear and your task continues until you run out of pegs (good) or run out of balls (bad). Whilst this may sound like a game lacking in extravagance, Peggle then wraps it all up in sickly sweet colours and sprinkles it with doe-eyed characters. Quite how a unicorn sporting an inane grin fits into a suped up bagatelle I’m not entirely certain. Looking at my own bagatelle it’s hard to imagine dousing it in florescent shades and associating it with mythical beasts, and this is where a many of the more cynical consumers are likely to be lost. Out of my circle of gaming friends many have said that they just can’t get past the look of Peggle. What Peggle offers these people is an opportunity to rethink their stance very early on. Complete a level successfully and out of nowhere Ode to Joy pipes up, fireworks spark from your ball and rainbows blossom at the bottom of the screen. The sheer ridiculousness of the reward and its contrast to the sedate nature of play is both super pleasing and a revelation. At this point you begin to understand what Peggle truly is: a game that never takes itself seriously. It stops being a cuter-than-cute arcade game and unmasks itself as a collection of elements lashed together with the sole aim of making a silly and addictive time sink. If you can relax into that then Peggle will just keep on giving. I found there a childlike sense of pleasure from seeing the balls bounce and ping around the pegs, and every new board was readily embraced to keep that feeling going. There are dozens of boards to play and each batch has its own theme. Their challenge ramps up throughout and so whilst the early garden styled levels bed players in, the later ones are heavy on awkward geometric shapes or moving scenery that test seasoned Pegglers. The hike in skill required to clear latter stages is evident. By the time a competent player has progressed through the main game, though, they will be attuned to the bounce and feel of the ball, enough to feel they can pull off the audacious shots needed. Just like a favourite pool table, you’ll know how the balls bounce and run and it’s just a case of lining up the initial shot. With each theme also comes a mascot, ranging from aforementioned unicorn, named Bjorn, to a dragon going by the title Lord Cinderbottom. Although all launch the ball in exactly the same manner, they offer variety through powerups. The effectiveness of each may vary but all alter how a board can be approached, the most useful being a mystic owl who hones your shot to zen-like perfection. Other can activate multiballs, create pinball flippers or detonate any close by pegs. A lot can be down to personal taste but there is a reason why the cult of Mr Owl has sprung up in Cheltenham. One aspect that I never considered before downloading Peggle was the social one. Armed with only a single television, Peggle has to be the game most likely to galvanise a room full of friends. Each ball is met with a chorus of “ooh”s and “ah”s and particularly crafty shots can have whole sofas on tenterhooks. Free balls and lucky bounces are serenaded with “good shot” whilst narrow misses have sympathies pouring in. Most might be down to physics and/or luck but you’ll take the support on board just as if everything after the initial bounce was down to a finely executed masterplan. Once you’re done just hand the controller on over to the next player in the circle and the fun just keeps on giving. Pass-the-pad at its finest. By all accounts, Peggle shouldn’t work. It’s a collection of seemingly random art assets combined with a game mechanic that ostensibly revolves around luck. And yet somehow this crazy mix works. Like so many simple concepts, its hooks can sink deep and everything from the ever rising pitch of the activated pegs to the constant positive reinforcement seems like a masterstroke. Above all, it’s about the search for the perfect shot. The one that even Mr Owl would be proud of. I believe that it’s only worth investing in a console if it does something different to the one that you have already. The success of the Wii possibly proves this as many have it a second console to complement a 360 or PS3. Having a PS3 to complement a 360, however, is slightly harder to justify; a quick glance from Joe Public and he could be forgiven in thinking that they’re just different coloured boxes offering marginally different flavours of cars, guns and guts. On the whole it’s reasonably true, too. I never wanted a PlayStation solely for Killzone, Uncharted and Gran Tourismo as I already have Halo, Tomb Raider and Forza, thank you very much. Under closer examination they may be completely different games but ultimately they do did not offer the massive shift in experience that would have been required to make me rush out on launch day to secure a PS3. In my opinion, the strength of the PlayStation comes from the more art-house games that I never could have envisaged being launched on a Microsoft console. As previously mentioned, this is lead by Little Big Planet and reinforced by a great number of PlayStation Network games (Sony’s equivalent to Xbox Live Marketplace). 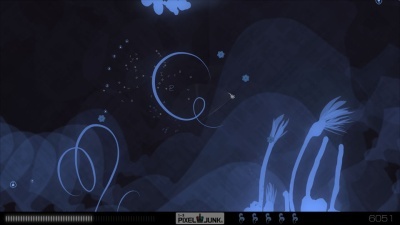 Favourite of those that I have tried so far is Pixel Junk Eden, a game that places you as a tiny shrimp-like creature in a very stylised, 2D garden. In a very similar way to firing a rocket in Worms, you launch yourself around the level, clinging to the plants that grow all around you and aiming to reach the higher points that hide your goal. You can only be launched so far, though, and further plants must be pollinated and grown to give you a framework to climb. Like so many downloadable games, it’s a very simple concept – climb high, collect pollen, grow plants, climb higher – and tied in with a very distinguished art style. Pollinate a seed and as you move away the shoots with rise and loop skywards, swaying in the breeze. Clean, flourishing strokes paint the garden and it’s impossible to mistake its screenshots as being from anything else. Despite the world’s simplicity, exploration is still your prime motivation as your goal is not reaveal to you. You know it’s somewhere “up there” and half the fun is swinging in between stems, grabbing pollen and putting further distance between you and terra firma in your bid to reach it. Thought is required, though, as with only a certain snapshot of the garden visible to you at any one time a misplaced jump could see you crashing unceremoniously back down to earth. I’m still only a couple of gardens (read: “worlds”) in but I believe I already have Eden pigeon holed. It is a game that I could boot up and lose hours to or just to fill a ten minutes gap, but ultimately Eden will be put on when I just want to chill out. In the same way I can relax with Piñata, the more considered Mr Driller modes and Animal Crossing, it is there for when I want to crash on the couch and not get wound up by steroid enhanced space marines. Rez without the beat, if you will. Currently the very sleek, shiny, black box that now lives in my TV cabinet is hogging a lot of my gaming time. I’m keen to explore what Sony has to offer in terms of games and services, especially those unique experiences that I can’t get on other platforms. By my own admittance the next few weeks will probably see most of my posts based around the PS3. They might even go some way to redress the balance of my Xbox-centric view on life. So far my PlayStation experience has been a good one, with one noticeable exception: the continual drops of bloated updates to the operating system. We’ve only had the system a week and at least three large patches have been forced on us, each taking roughly a quarter-of-an-hour to be installed. I had heard about these downloads before but optimistically assumed that people were exaggerating. If only that were the case. The kicker is that I wouldn’t mind if the functionality being added was a seismic shift to what was there before, but when the patch notes declares that “Text Messaging” I was staggered. I was torn between wondering why that hadn’t been included sooner and how on earth text messages could produce such a huge download. The thought of new features being added on a semi-regular basis is a good thing, don’t get me wrong, but that has to be balanced out against the disruption caused to the player. The Xbox manages this well, in my opinion, making a feature about big updates once or twice a year whilst dropping tiny bug fixing patches almost unnoticed in between times. Hopefully I’ll get used to this new system – may they’ll only drop once a month, I don’t know – but for now I sit in fear of turning the PS3 on and seeing the quiet notification telling me a new update is available. Time to put the kettle on. One of the benefits to getting married – apart from the love, commitment and relationship that it celebrates – is the wedding list. A means devised to make sure that your guests don’t all accidentally get you both toasters. Ours was mainly full with new crockery, cooking equipment and other bits and pieces for around the house. What also crept on there was something very shiny. Speaking to others who have gotten married, mainly grooms, everyone has tried to sneak something on theirs that has been somewhat cheeky: Aston Martins, big tellies, that sort of thing. In a similar vein I managed to add a PlayStation 3 to the end of ours, more in hope than expectation, but thanks to Ali’s extremely generous aunt (or more precisely, her cousin who persuaded his mum) we are now the proud owners of Sony’s current console. The thought of even asking for a PlayStation made me feel odd to begin with. Not only the MS connection, but I’ve never really gotten along with Sony and throughout the lifespan of the PS2 I only ever owned Pro Evo as I was perfectly satisfied with my Xbox and GameCube combination. With the advent of the “next-gen”, though, I’ve found it harder to resist. From the lure of Blu-ray built in and games such as Little Big Planet I think it was almost a case of when and not if. First game to be put in the drive was indeed Little Big Planet. After playing Mario on the DS on holiday I can honestly say that my first impression of it is that it takes the baton of 2D side-scrollers and runs with it. The sheer range of challenge, the feel of the controls and the broad and colourful look is simply wonderful. More on that later but tonight we watch our first Blu-ray. End of our first week back and we settle down to watch Serenity in HD. Shiny. 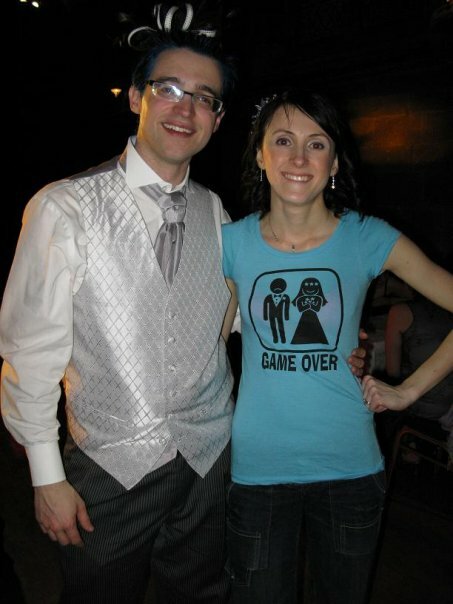 Our honeymoon saw some role reversal. No, not like that. At home it’s usually Ali that loses me to colourful moving pictures; I’ll sit down, controller in hand promising I’ll just be a short while only to find her asking me to turn down the volume as it’s gone midnight and she’d like to get some sleep. Away from home, however, Zoo Keeper on the DS has become something nearing crack to my new wife. We’d get back from a day wandering around a lost civilisation or seeing the finest paintings that Italy has to offer and it wouldn’t be long before the plinky plunky sounds of the DS’s tiny speakers would signal that I’d lost her for another hour at least. If only she wasn’t so good at it I’d probably lose her for a lot less time but watching this woman match trios of animals is to witness a skill approaching an art form. My holiday gaming consisted of revisiting some classics: Mr Driller, a DS launch title, still remains a firm favourite, especially in the more considered modes that aren’t based purely on speed; the relatively unheralded Nintendo Touch Golf is always worth a round or two; and starting Mario over can never be faulted. But now matter how much I played, Ali’s talent meant that she was always playing after I’d long put down my DS. The only saving grace is that Zuma and Peggle haven’t made it to DS yet otherwise the only thing that would have gotten her away from the stylus would have been a flat battery. And so I return a married man. 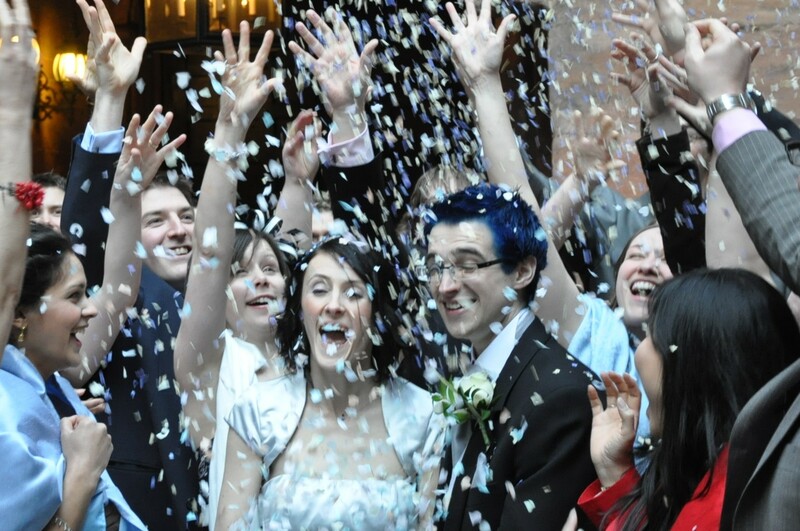 It seems a long time ago now but on 14th March Ali officially became Mrs BIGsheep in a ceremony held at St Mary’s Guildhall, Coventry. The entire day was an incredible experience, from when Ali appeared looking stunning at the end of the aisle to having so many friends and family around us, and all the little touches that just made the day – one being a Maxi as our wedding car and having a chauffeur driven ride round the historic portion of the city. Quite where the day went I don’t know as it flew by in a flash. A few experienced grooms had warned me of this but until I was in the thick of it I hadn’t quite expected just how quickly time would tick by. One minute I was there in the hotel attempting to get my usher to put down his hair straighteners and head to the venue, the next the lights were fading up and the DJ was packing away. A thank you to all the friends and family who were there to make the day so special and a thank you those who we just couldn’t be squeezed in for being so understanding.